Maple City Market Food Co-op worked with Goshen College to show internationally-acclaimed filmmaker Steve Alves’ documentary “Food for Change” on Oct. 30 in Newcomer Center. 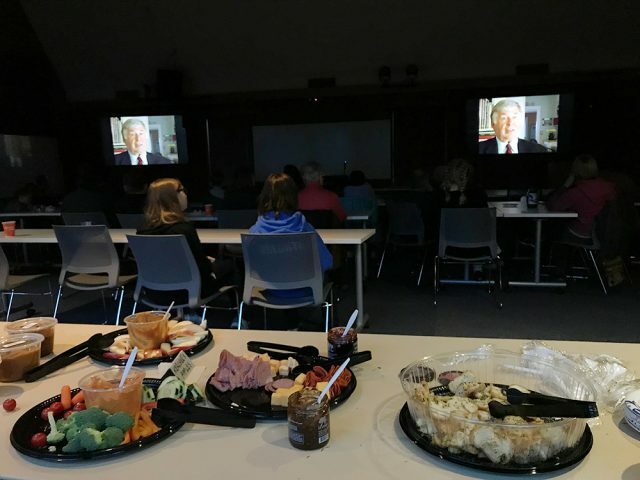 Food co-ops across more than 50 cities in the United States are presenting screenings of the film on college campuses and Public Broadcasting Service shows for the month of October. October is National Co-op Month which became nationally recognized in 1964 by Orville Freeman, former U.S. Secretary of Agriculture. All students, Maple City Market co-op members and the general community were invited and encouraged to attend the free screening. The film follows the food cooperative movement. Although co-ops have been around for years, “Food for Change” takes viewers on a journey from the Depression-era prevalence of co-ops to their evolution in the civil rights era and finally to present-day America. The documentary’s goal is to present viewers with the perspective that food co-ops are a force for social and economic change in American culture. “It’s American history, from the Great Depression to the present, with co-ops as the protagonist,” said Alves. A food co-op is a place that community members can purchase healthy, local produce and grocery items. In late 18th century Europe, co-ops were made as a way for community members to purchase wholesale goods during the Industrial Revolution. During this time, people were moving away from their farms and to the cities for work, where they had to depend on stores to supply their goods. Many years later, in 1970’s America, food cooperatives introduced a healthier alternative to eating. The world of organic food and cooking also had light shed upon it. Food co-ops are alive and well and they are making a comeback today. There are many types of cooperative businesses such as food, daycares and even credit unions. In the United States today, there are over 29,000 co-op businesses and 350 million co-op memberships, according to Co-op Stronger Together. Co-ops are owned by members. The business is run autonomously, therefore, each member takes part in making decisions. If there is excess money, the money is put back into the business or distributed amongst its members depending on their use of the store’s services. This makes the cooperative business incredibly unique. Co-ops do face many challenges as they compete with corporate chain businesses. With corporate business on the rise and their prices getting lower, co-ops, local farmer’s markets and local grocery shops are having to spread the word that there is a healthier and better-quality alternative to shopping available. When shopping at stores such as Maple City Market, located in Downtown Goshen, consumers are not only purchasing locally sourced produce and fair-trade goods, they are also supporting small-scale agriculture and reducing their environmental footprint. In recent years, studies on sustainable food systems have been rising and the more people are learning about where their food comes from and what exactly is in it, the more they are turning to organic and locally sourced goods. Food for Change presents viewers with both historic and modern footage of the evolution of co-ops. The filmmaker and narrator Steve Alves focused on his hometown co-op, Franklin Community Co-op in Greenfield, Massachusetts as well. The Food for Change team spent seven years making a film to encourage Americans to see the truth about their food and to work towards a better tomorrow for themselves and their families.